The Bilged Boatswain Mouse is a breed of mouse found in the Harbour. In charge of the equipment and the operating crew of the ship. 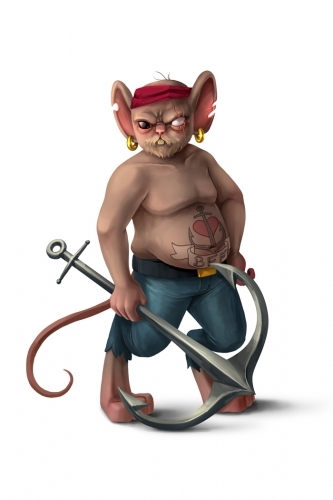 This bilged and bulging mouse delegates daily work orders and makes sure all ship repairs are done on time. His favourite job is hoisting the anchor, who is also his best friend. The Bilged Boatswain Mouse has no specific preference for any kind of cheese. The Bilged Boatswain Mouse drops the Pirate Crew Egg during the annual Spring Egg Hunt. 11 April 2017: The Bilged Boatswain Mouse was added to the game with the introduction of new content to the Harbour location. 17 October 2018: The Bilged Boatswain Mouse changed mouse groups from Aquatic Order to Dock Dwellers. This page was last edited on 6 December 2018, at 19:39.